A return specialist or kick returner is a player on the special teams unit of an American football or Canadian football team who specializes in returning punts and/or kickoffs. There are few players who are exclusively return specialists; most also play another position such as wide receiver or running back. The special teams counterpart of a return specialist is a kicking specialist. The kickoff returner position is often played by a small, faster player such as a cornerback, running back or wide receiver. Backup players frequently assume this role so starting players on the offense take less hits as the kickoff returner position, and can play their regular positions. In the days of one platoon football, the returner position was synonymous with the "safety man" - a quarterback or halfback. In 2012, NFL commissioner Roger Goodell proposed the idea of removing the kickoff play, and quoted that the "kickoff return is too dangerous for the game." The idea was met with criticism and the idea was eventually dropped. Gale Sayers was an All-Pro running back who also returned punts and kicked for the Chicago Bears. He was inducted into the Hall of Fame in 1977. He currently holds the record for the highest kickoff return average at 30.56 yards per attempt. Brad Oremland of Sports Central called him the greatest kick returner in NFL history. Punt returners sometimes also return kickoffs and usually play other positions, especially wide receiver, defensive back and running back, although sometimes as backups. An analogous position exists in Canadian football, though differences in rules affect play considerably. See comparison of Canadian and American football for a complete discussion of the punt returner's role in the Canadian game. ↑ Greenstein, Teddy (2010-08-24). "Northwestern's Mark attracting notice: Freshman likely to get nod returning kickoffs and will get shot at punts". Chicago Tribune. Retrieved 2012-12-11. ↑ Rosenthal, Greg. "Roger Goodell mulls idea of eliminating NFL kickoffs". NFL.com. Retrieved March 17, 2013. ↑ "Cordarrelle Patterson ties NFL record with 109-yard kickoff return". CBSSports.com. 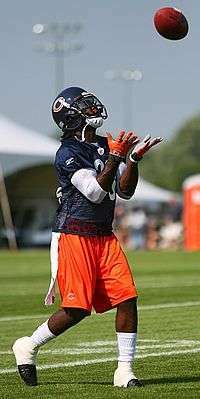 ↑ "Devin Hester passes Deion Sanders for return TD mark". NFL.com. ↑ "Red Grange, Football Hero of 1920's, Dead at 87". The New York Times. 29 January 1991. ↑ "The Best Kick Returners in NFL History". sports-central.org. Retrieved January 12, 2016. ↑ "Top 10 returners in NFL history". 20 December 2007. ↑ "Football Special Teams: How to Return a Punt". ↑ "Football 101: The Rules of NFL Football Fair Catch".